THREE GLOBAL MEETINGS TO PRODUCE ANTICHRIST ARE NOW! Title: THREE GLOBAL MEETINGS TO PRODUCE ANTICHRIST ARE NOW! Subtitle: We reported in NEWS1052, issued in September, 1996, that the final plan to implement the New World Order and to resolve the Jerusalem status would only occur as the result of simultaneous meetings of Political, Religious, and Economic meetings. Just such meetings are now planned; can the coming of the Great One be far behind? When I was fortunate enough to be able to attend the Members-only Seminar given by the New England Director of the House of Theosophy, Bill Lambert, little did I recognize the importance of the information he was going to disseminate. Lambert revealed details of the appearance of The Christ [Antichrist], the decision just made to name the Roman Catholic Pope as the False Prophet, and the fact that the Guiding Spirits were revealing to New World Order leaders that the Rapture of believers was going to occur, soon after the appearance of The Christ. Let us examine the plan, and then we shall examine the Daily News to see just how events seem to be planned that will fulfill this part of the New World Order Plan. Lambert says this festival of these combined religions will create the New World Order Religion, which will be the religious equivalent to the United Nations. As we have repeatedly noted, the tsunami wave toward a merging of all religions in the world has been ongoing, and has now engulfed all major religions and denominations. Pagans believe in the "synergy of forces" the great "OM ", and this is no exception. 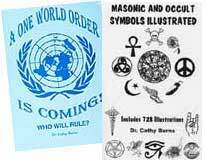 They believe that, once they can create these conferences involving religion, economic forces, and political forces, they can finally create enough "synergistic energy" to be able to force the world finally through the portal of the New World Order of Antichrist. However, Lambert revealed that the immediate impact of these "synergistic" conferences will be the final creation of the "combination Temple/Church/Mosque in Jerusalem". This religious building will be one of history's greatest ecumenical achievements. Lambert refused to answer my specific question as to whether this ecumenical building built to house the world's three greatest Monotheistic religions would be built on the Temple Mount. If it is not built there, we know this temple is not the temple Antichrist will ultimately enter and defame at the mid-point of the Tribulation Period. However, the building of this combined Temple/Church/Mosque in Jerusalem is planned to finally break the Middle East logjam, according to Lambert. However, he than immediately stressed that the force needed to finally implement this plan is war and the threat of war. "The impetus toward this type of settlement is made possible only because of a general fear of war. This fear of war must be maintained until the desired political and religious changes are instituted." Now you know why the Middle East has been kept in absolute turmoil all these many decades! This concept that war and fear of war is needed to implement this plan is classic Dialectic Process, which states that "conflict brings about change and controlled conflict brings about controlled change". This Middle East conflict and threat of conflict these past 40 years has been planned, in order to bring about the controlled changes they so ardently desire. But, then Lambert said something very unexpected. He said: "Any permanent solution to the Middle East conflict would also have to see the religious portion of the problem solved. Once this religious problem is solved, then the power and influence of the Orthodox Jews in Israel would permanently decline." Prior to this statement, I did not know how much the Illuminati detested the Orthodox Jew. The leadership of the Orthodox Jewish movement is Cabbalist, and the Illuminati has as one of its foundation stones the Jewish Cabbala. However, the Illuminati views the extremist views of the Orthodox Jew to be a threat, and wants to defuse and defang this threat. The extreme irony is that the Illuminist knows that Antichrist will have to deliberately stage the fulfillment of all the prophecies concerning Messiah found in the Old Testament before the Jewish people will accept him as their Messiah; this fact means that the Orthodox Jewish leadership will be the target of this deception. If their leadership has been previously weakened by a settlement in the Middle East, their support for the claims of Antichrist will be easier to obtain. You can get more details about his summit from http://www.millenniumpeacesummit.org/aboutframe.html which is the official website for this event. We all need to take note of the religious leaders taking part in this summit. Anyone attending will be automatically labeled as working for the coming Antichrist; we will then know the truth about anyone attending. This summit is a gathering of economic leaders from all over the world to discuss the economic and societal impact of Globalization. Chaired by Mikhail Gorbachev, this summit would fulfill the New Jerusalem Covenant Plan as noted above. This meeting will be held in New York City. When I clicked on http://www.worldforum.org/ which is the website explaining this summit, I noted that General Colin Powell is the Chairman of the entire summit! This fact is just one more proof that both Democrat and Republican are equally committed to the New World Order and to its complete implementation. Republicans should stop falling all over themselves trying to get Colin Powell to run for President, on the misguided and mistaken belief that he would reverse this entire process of socialization and globalization and would restore American sovereignty! Nothing could be further from the truth. Held in the United Nations in New York City, this meeting will essentially confer upon this body the mantle of supreme government in the world, in all aspects [Read NEWS1394 for full details]. We are not sure exactly when the United Nations will begin to act vigorously as the supreme government of the world but are sure it will not occur until Antichrist arises to take control. The Plan calls for Antichrist to appear as the result of a Third World War between Israel and her Arab neighbors, during which all countries now being governed by the consent of the governed will have had their systems of government "temporarily" suspended as a way in which to deal with this planned crisis. Once all systems of government are suspended and control in each country is exercised by a dictatorial figure, then it will be easy for each of these leaders to give his support to the Antichrist, and to his government, the United Nations. Thus, it does appear that the concurrent -- nearly simultaneous -- meetings of key global leaders in the realm of Religion, Economics, and Politics that were planned back in 1991 as being necessary to produce the Ecumenical Jerusalem they envisioned, indeed may be taking place between August 28 - September 10. These meetings are supposed to clear the way for agreement to internationalize Jerusalem and create a religious meeting house for all three Monotheistic Religions -- Judaism, Muslim, and Christian. After describing these three meetings, Lambert then said: "At the proper moment in history, the Pope will visit the combined Jewish/Christian/Moslem sector of Jerusalem to announce that all religions should be combined into one. This action will then finally break the Middle East logjam." Therefore, we can assume that the Pope will be making a visit soon to Jerusalem, after these concurrent meetings are concluded, to make this grand announcement. This announcement will declare that this agreement clears the way for Jerusalem to finally know "Peace and Safety [Security]". Then, according to the Apostle Paul, we know that annihilating war will immediately ensue [1 Thessalonians 5:1-2]! After speaking of this planned visit to Jerusalem by the Pope, Lambert then launched into a discussion of the appearance of Antichrist. He quotes Alice A. Bailey, from her channeled book, The Externalisation of the Hierarchy , as to how the Antichrist may finally be produced. At these three concurrent conferences, "men and women of goodwill" will act as the "world aspirants and disciples" they truly are, and will "focus their will" so that the world may finally be moved to the global system of Antichrist! Then, Lambert immediately begins speaking of the appearance of Antichrist! Isn't it exciting -- and terrifying -- to apparently be witnessing the outworking of this last part of the Plan to produce Antichrist in your Daily News? Finally, after Lambert gave us many details of the appearance of Antichrist, he then speaks of the simultaneous disappearance of millions of people all over the world, for the sole reason that they could never be "proper receptors" of The Christ [Antichrist]. Of course, this is the Rapture of the Church. 1. Nearly simultaneous meetings of Religious, Economic, and Political leaders to properly "focus their will" so as to finally move the world into the New World Order and to set the stage where The Christ [Antichrist] could finally appear. This part of the New World Order Plan is apparently being fulfilled by these three conferences noted above. 2. The Pope will travel to Jerusalem to declare all religions are now one, with him as their head. Jerusalem will be internationalized and plans announced for a combination Jewish/Moslem/Christian house of religion. 5. The Rapture of the Church occurs. World events do seem to be spiraling toward the staged appearance of Antichrist. In your Daily News!